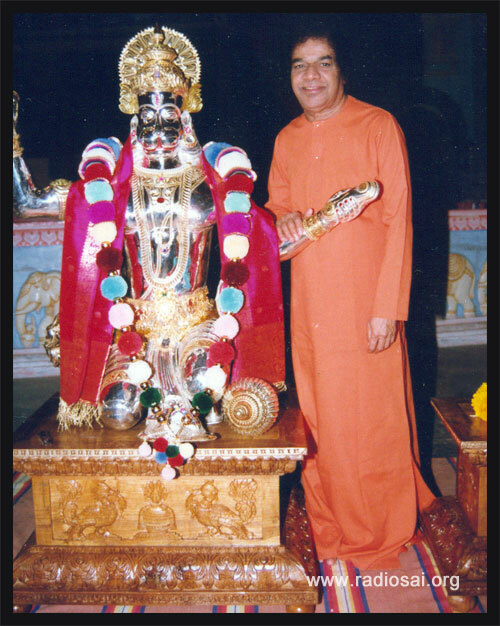 Hanuman, Our Lives and the Annual Sportsmeet a study circle on why Swami hailed Hanuman as the ideal for His students and devotees Part – 5 Life is Love; Enjoy it! Life is Love; Enjoy it! On His 65th Birthday Swami unveiled the gigantic 65-ft statue of Hanuman in the Hill View Stadium. On the day of His Birthday the Lord chose to install the statue of not any of His forms but the image of His devotee. When we in Radio Sai ruminated on this many powerful insights emerged and we ended up recording a lovely one and half hour panel discussion with two other alumni serving in Baba's university. We played this on two successive Thursday Live programmes in December 2013 in the segment 'Outside Inside and Deep Inside' which is hosted by Bishu. Given the salient points that surfaced in this session we are sure it will help many on the spiritual path to progress towards their goal faster and with much joy. Presented below is the edited transcript with illustrations of the final two parts of this discussion moderated by Radio Sai's Bishu Prusty (BP) and participated by Dr. Deepak Anand (DA) and Sai Giridhar (SG) from the SSSIHL. If you have missed the earlier parts do read them by following the links above. BP: It is so fantastic when you look at this entire continuum. It ends with duty — Rama Kaarya. At that point your life actually becomes a celebration; it becomes an unending saga of love for God. When you are in that state there is no time when you feel you're deprived of anything because you've got the highest. What comes to mind is another quote of Bhagawan — ‘Life is love; enjoy it.’ We saw ‘Life is a game; play it’ and you gave all those examples explaining 'Life is a challenge; meet it'. Now even the dictum ‘Life is love; enjoy it’ is seen so beautifully in Hanuman's personality, because his only aim in life was aspiring for God's love and doing the Lord's work. For him life was always joyous. BP:Even as we talk about Hanuman and the Sports Meet preparations, many times in the morning when I jog and go up to the summit of the hill and stand at the feet of Hanuman, I get such an expansive feeling. You see the panorama of Puttaparthi that is in front of you. You almost feel you're on top of the world, on top of Puttaparthi. The thought that comes to me is everything is there at your command. You feel like the king of the world when you choose God. As it is said in the Bible, “Seek the kingdom of God and everything else shall be added on to you.” I personally get this feeling whenever I go to Hanuman. SG: That is the view which Hanuman gets every day. He gets to see the entire expanse of Puttaparthi in front of him. He must be feeling on top of the world! DA: That is what we also feel. When we all come to Bhagawan and He accepts us, is it not the same feeling that we get — that we are on top of the world? Recently I was in Singapore and Malaysia. When I went to any place to give a lecture or to talk to devotees, there was so much of warmth and feeling of love and concern — of those people towards me and me towards them. I was wondering, “What is this selfless love?” It is the same love that God has given us. When we have love in our hearts, doors keep opening. In fact my coming to Puttaparthi was the opening of such a door. 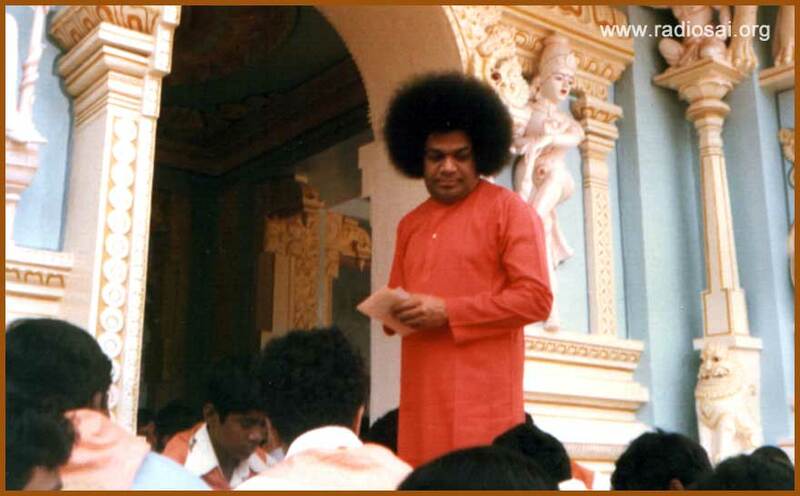 When I came to know about Bhagawan and He infused in me the seeds of devotion for Him, I was very keen that come what may I must become Bhagawan's student. In 1991 I came to Bhagawan. I was still a second-year student of my B.Com. (Hons.) course in the Delhi University. Finally when I came for my MBA exam in 1997, I did not fare well in the interview. Bhagawan was in Kodaikanal. I went to plead and said, “Swami, please give me a seat in MBA.” Swami did not speak to me but took my letter. After six years, I got the seat by His will. The desire and devotion to be His instrument and to be with Him and experience His love first-hand was so intense at that point in time that He opened all the doors for me. Later He said, “I told you ‘Zaroor, zaroor’ (‘Sure, sure’) six times for the reason that was going to take you six years to come for the MBA course.” It was all His Divine master plan. But I think our devotion and our determination to be close to Him and do Sai Rama Kaarya does help in the process. BP: All the time we will see that obstacles slowly melt away when we have devotion for the Lord; there is no obstacle which is really so debilitating. 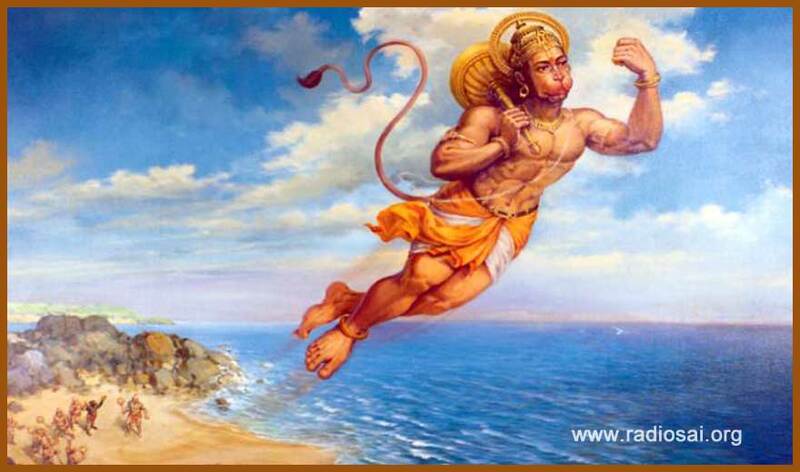 If we see the Ramayana, when Hanuman is crossing the ocean or when he goes to get the Sanjeevani mountain, at every instance there is someone or the other appearing on the scene and guiding Hanuman. Again, when Hanuman goes to bring the Sanjeevani mountain, he drinks water from a lake and a crocodile attacks him there. Once Hanuman vanquishes this animal, it transforms into a celestial being and guides him. So you see that at every instance you will be guided. SG: Tests indeed are the Lord's taste. When you pass a test, His grace automatically flows in abundance. BP: The joy of life in those circumstances is something not comparable to anything else. You feel that every moment of your life is a celebration because you are all the time in communion trying to do His work and there's nothing that is wanting in life. DA: Absolutely! Even when you face challenges and difficulties, you can always hold on to Him and get the solutions. This format was not very convenient because I like to speak from my heart; memorising the lines was difficult for me. We had rehearsals in the Poornachandra Auditorium but I was forgetting my lines. On the day prior to the presentation, I forgot my lines and everybody including the Vice Chancellor was very nervous about what would happen the next day. Neither could I be replaced by somebody else nor was I able to perform. Next day the performance went on very well and Swami blessed us all with a group photograph, keeping His hand on our heads. It was just phenomenal! With these thoughts I started coming down. It was already 7.30. At 8 o'clock the lines would leave to the college. I still had to have bath and breakfast. I was rushing down and suddenly I heard the siren of the police jeep that used to follow Bhagawan wherever He'd go. Those days a distinguished devotee was not well in the Super Speciality Hospital and Swami was visiting him very frequently. I thought Bhagawan was going to see him. But as I came down towards the statue of Krishna, I realised that Swami's car had already entered the Hill View Stadium. I thought, “May be Swami is entering the stadium but normally He'll take a round through Shanti Vedika, go past and then return to the ashram.” I did not bother and started coming down. When I came to where Lord Shiva statue is, I saw that Swami's car was actually coming up the hill and there was no way to run away. Swami would certainly cross me. And I was in my track pants and t-shirt. I thought Swami would scold me as it was already 7.30 and there was nobody else in the stadium. I hid myself behind a bush. I thought Swami might not see me and that He might be coming for some other purpose. I felt He'd go to Hanuman and return. But lo and behold! Swami's car stopped just before me. Suddenly Swami's contour changed and He became very happy. He showed His abhayahastha (palms raised in blessing) and said, “Very, very, very happy.” As He went up a little more, I thought He'd go up to Hanuman and return. But at the space behind the statue of Krishna, Swami took a turn and returned to mandir. I was a little perplexed because having come all the way He didn't even go to Hanuman. I wondered, “Why did He come here?” I had no answers. In the evening along with two other research scholars and our Vice Chancellor, Swami calls me inside. I enter and everybody else is seated in their places. Swami spoke to the Vice Chancellor regarding some official function which was to happen a few months hence. Suddenly Swami changed the topic and looked towards me, and then asked, “Neeku Hanumanthudu ishtamaina? 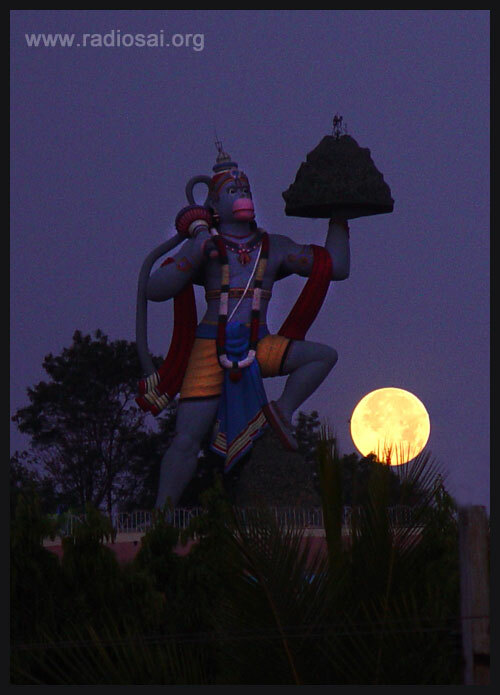 Do you like Hanuman?” I was surprised but said, “Of course yes Swami.” He called me closer and materialised a beautiful chain with a pendant which is a replica of the Hanuman on the hilltop. BP: Wow! The same posture? SG: In the Hanuman Chalisa (devotional hymn addressed to Hanuman), it is said, “Tumhare Bhajan Ram ko Pavai.” Saint Tulsidas writes that if you worship Hanuman the worship reaches Rama Himself. This is a living example of that. You wanted to do pradakshina around Lord Hanuman and Swami directly accepted that offering. BP: When one reaches that height of faith and devotion, then devotee and the Lord become one. What do you think about this discussion? Please let us know by writing to [email protected]. Do not forget to mention your name and country. Copyright © 2009 Sri Sathya Sai Media Foundation. All rights reserved.